Firefighter lighting grass using a drip torch. Prairies depend on fire for ecosystem stability and diversity. 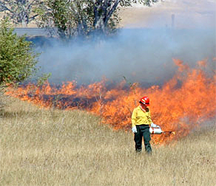 Fire eliminates invasive plants and makes soil chemistry more suitable for grasses. In the absence of fire, shrubs, trees, and exotic grasses would dominate. Today many of the prairies that remain are managed by prescribed burns. In organizations, the "grassfire" of chains of broken promises serves an analogous purpose. Cleared of commitments, the organization can change directions more nimbly for a time, until it gets locked in by a new web of commitments. Photo courtesy U.S. National Park Service. Bad things happen. We plan and we plan, and sometimes bad things happen anyway. Even when we anticipate difficulties, events might unfold in unanticipated ways, or we might be unable to execute the plans we had because of other unanticipated events. Yet, when bad things happen, we can feel like failures. We might believe there was something more we could have done. We lose confidence. Our performance degrades. If this cycle continues, it can affect our personal lives — even our health. Why we do this is a bit mysterious. In calmer moments, we do know that we can't control everything, but maybe we want to feel like we're in control of more than we actually are. It's a difficult habit to break. To make some progress, though, to come to peace despite failures, we can contemplate exactly what in Life truly is beyond our control. Sometimes there really is something more we could have done. Usually there isn't, but even when there is, given what we knew at the time, it's possible — even likely — that we made appropriate choices, despite the clear indications otherwise when viewed with hindsight. It's possible to have made correct choices given the information we had at the time, and then later to realize that if we knew then what we know now, we would have made different choices. That's OK. Even when hindsight reveals a better alternative, it might not have been possible at the time. Choosing it might have resulted in disciplinary action, reassignment, or termination. Was it a real choice? Even if we had advocated it, would it have been approved? Would people have supported it? Would resources have been available? Hindsight might reveal a better choice, but the then-current reality might have precluded it. possible at the timeour plans and decisions depend on commitments from others — assurances of support, resources, reliable information, and more. They promise, and we accept their promises. Sometimes, people break their promises, usually involuntarily. They give their word based on promises others make to them. Viewed this way, modern organizations are little more than webs of promises, and when some promises are broken, promise-breaking travels through that web like grassfire. There isn't much anyone could have done about it. When your plans fail because of one of these global promise collapses, is there anything different you could have done? Probably not. Would you like to see your comments posted here? rbrenEXkxZadQfhDZhJPbner@ChacTJYQbZGiJlYCfUnLoCanyon.comSend me your comments by email, or by Web form. I offer email and telephone coaching at both corporate and individual rates. Contact Rick for details at rbrenvwqqolkuZHzzppmBner@ChacOEfcAJYhNbOfAoMUoCanyon.com or (650) 787-6475, or toll-free in the continental US at (866) 378-5470.